So I had this mad idea that I could probably make those little slices of Fimo cane nail art thingies. Well… maybe not. The making went well, the baking went too well, and the slicing did not go well at all. The problem; I baked the cane for too long, it was too brittle to cut thinly. I’d like to try again, I found it fun. 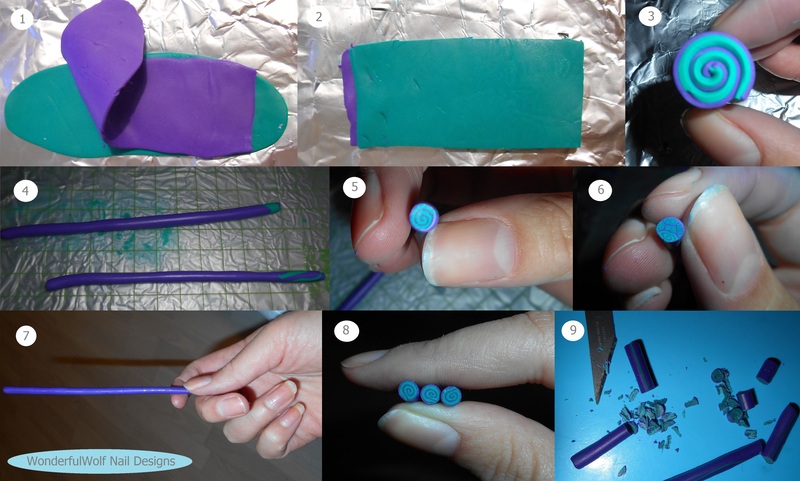 Has anyone ever made their own Fimo canes for nail art? Here’s a sort of step-by-step of what I did. 1. I rolled out two pieces of fimo really flat and put on on top of the other. 2. I trimmed the edges, but made sure to keep one colour longer than the other so I could get a good roll. 3. Rolled them together which then create the spiral pattern. 4. Kept reducing the size of the roll by rolling them out longer and longer. I had to cut the roll in two as it was getting too long to control how even I was rolling it. 5. Trimmed off the ends, and as you can see a lovely small spiral of perfect size for using on my nails. 6. I went a step further and experimented with adding spirals together and again reducing them. Look at that funky pattern! 7. I baked the cane for 30mins, which I now suspect was way too long. 8. The baked cane cut into three. It was okay to cut into big chunks. 9. And the ‘fail’. Look how brittle it is, it just disintegrated! I just couldn’t get it to slice nice and thin like the ones you buy. Boooo. Never mind, I’ll try again! That’s such a cool idea, I have been thinking about giving it a try, but then I never had the time. Hope it turns out well next time! It was on my ‘list-to-do’ for ages too! The process didn’t take too long, but as pathetic as it sounds, its the time getting everything out, a clean working space, cleaning everything up etc etc. You should definitely get round to it though, it was fun! Awww, that might be the trick! I wondered if it would squidge the pattern too much. I will have to experiment! Aw wow! Great tip, thanks so much. I’ll definitely have to give it another go now!